Born in America to English parents and educated on both sides of the Atlantic Maxine Naylor, Professor of Design, joined the Faculty of Arts and Architecture in the summer of 2007 to lead its new Design Research Institute. 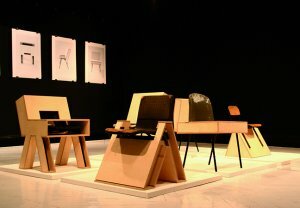 Naylor previously held the Chair of Design and was Head of Design at the University of Lincoln. Since gaining her BA (Hons) in Furniture Design at Middlesex University in 1979 and MA in Furniture Design at Buckinghamshire College in 1981, Professor Naylor has become an award-winning and influential designer exhibiting internationally in the United Kingdom, Europe, Far East, Canada and the USA. She has worked as an independent designer since 1982. Naylor has taught at universities throughout Europe and the USA, she has more than 20 years experience in the art and design higher education sector, with involvement in furniture, applied arts, interior design, architecture, industrial design, graphics, jewellery and metalwork. She has been Course Director for Furniture Design in the School of Architecture, Interior Design and Furniture at the Royal College of Art and Associate Head of Design at Goldsmiths. Naylor's research is defined as critical design practice and is concerned with creativity and innovation. Her research specifically addresses the material re-evaluation and cultural re-appropriation of furniture forms and artefacts. Her work challenges the established orthodoxy and protocols of design practice and questions the traditional boundaries of art, craft and design. It has received high critical acclaim and won international design awards being cited for its experimental, unorthodox, critical and influential approach to design and visual culture. Professor Naylor has been extensively published and reviewed in the key international design books and magazines. Naylor is also the successful recipient of a number of research grants from the Arts and Humanities Research Council. She has recently authored the book Form Follows Idea - An Introduction to Design Poetics. Ralph Ball is Professor of Design at Central Saint Martins University of the Arts, London. Graduating from the Royal College of Art in 1980 Ball has achieved both critical and commercial success across the design field with work ranging from one-off commissions to mass-manufactured products. His award-winning and influential furniture and lighting design, exhibited widely in the UK and across Europe, Scandinavia, Asia, Australia and the USA, includes two solo exhibitions in London. Ball has received numerous design honours including awards from the Industrial Designers Society of America (IDSA); Concord Illumination (Best Lighting) and the British Design and Industries Association. His work is held in permanent collections in the UK, France and the USA and has featured in many design journals and books. In the early 1980s, at Foster and Partners, Architects, London, Ball designed signature furniture for the Renault Building (Swindon UK) and for HSBC's corporate headquarters in Hong Kong. The Renault furniture is the forerunner of the Foster 'Nomos' office system and is widely acclaimed. Professor Ball has lectured at numerous design institutions and events. In 1988 he was appointed Professor and Chair of Industrial Design at the University of Washington USA, returning to Britain in 1993 to take up academic roles at the Royal College of Art and subsequently at Central Saint Martins. Professor Ball says of his work: 'My research is in critical design and concerns the generation of conceptual artifacts, which both illuminate and question contemporary design culture. I call this activity ''design poetics''. Design poetics forms an experimental, continuously evolving series of objects and collections, which act as commentaries and contemplations on the cultures of Modernism, Postmodernism and contemporary design. The work rejects the discrete distinctions of art, craft and design. It explores the conceptual, provocative, poetic and lyrical possibilities of the spaces in between. In 2004, Naylor and Ball were awarded a major AHRC Innovation Research grant for 'Sustaining Desire: the chair as cultural, ecological and visual narrative; exploring the relationship between narrative, materiality and the emotive'. The project generated a collection called Archaeology of the Invisible, which was exhibited in Milan, Paris, Glasgow, Shanghai and New York. They have subsequently completed a book about their work and ideas called Form Follows Idea: An Introduction to Design Poetics (Black Dog Publishing, London and New York). Ball and Naylor's collaboration and exhibition, Indeterminate Cases, was presented in the prestigious La Sala Vincon, Barcelona (Oct 2008).